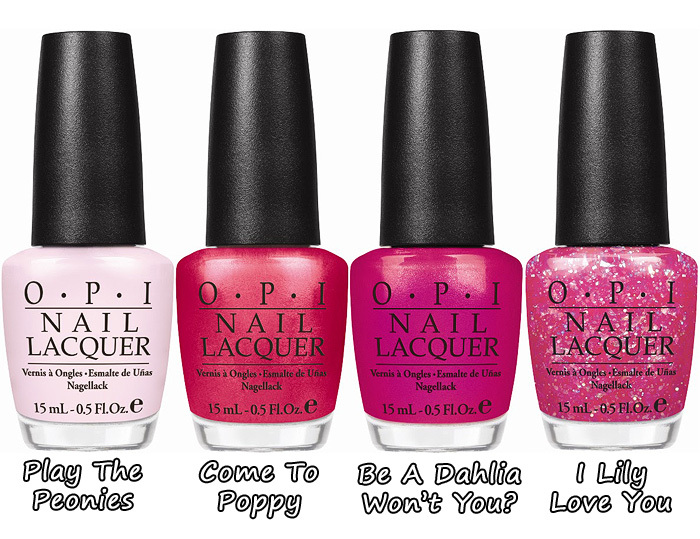 OPI Nice Stems Collection for Summer 2011 – Think Pink! It’s very pink isn’t it? Play the Peonies: We’d put our money on this lovely soft-pink. Come to Poppy: Surrender to shine with this shimmering coral-pink. Be a Dahlia Won’t You? : Give the gift of fabulous fuchsia—to yourself! I Lily Love You: Fall head over heels with this light pink sparkle. Unusually for me, the only one that’s *really* calling to me is Come To Poppy, though I’d be willing to bet my dinner on I Lily Love You being a sell-out! Will any of the offerings from OPI‘s upcoming Nice Stems collection be gracing your nails this Summer? I want them all although I Lily Love You is calling to me in particular! Shame I don’t have a birthday coming up for yonks! Where do you get press releases from? I’m just curious! Just by signing up to brands’ emailing lists? Do you think I Lily Love You wull be like Pink Me I’m Good? I’ve want that one for-ever! Oh my goodness I Lily Love You is miiiiine. Love it! I agree – I Lily Love You sounds hot! Oh ‘Come to Poppy’ looks beautiful. Lovely shades! Lily I Love You looks like it will be my fave, but I am going to google for some swatches first. Just to make sure! I love all! So cute! argh! I love them all! I can’t wait to get them all, especially I lily love you! I really like “I Lily Love You” but I have so many glitter polishes already. I think I should start collecting some creams. The Katy Perry/OPI collection sparked my interest in glitter nail polishes so I think I’ll have to have I Lily Love you ! Here Come The Girls... Boots NEW Christmas ad airs tonight!